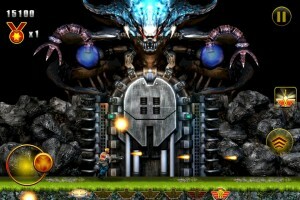 BEIJING – June 27, 2013 – Leading international mobile game developer and publisher CocoaChina/Chukong today announced the upcoming U.S. mobile launch of Contra Evolution, the first fully licensed mobile version of Konami’s classic alien-shooting side-scroller Contra. Initially launched in January 2013 in China, Contra Evolution reached the number one paid spot in less than 24 hours, and the US release marks the official beginning of a partnership between CocoaChina/Chukong and Konami. The game is a complete mobile reincarnation of the original Contra game, for which CocoaChina/Chukong has secured the worldwide publishing rights. The launch marks the first time that Contra has been officially released for mobile devices. With an Android version coming soon, Contra Evolution is scheduled to launch in the Apple App store on June 27th: the iPhone version will cost $0.99, while Contra Evolution HD for iPad will cost $2.99. Founded in 2008, CocoaChina is the first and largest Chinese developer platform dedicated to mobile game development. CocoaChina began as a forum for Chinese iOS developers and now operates under the umbrella of Chukong Technologies. PunchBox Studios, which also operates under Chukong Technologies, was created by the same team behind CocoaChina to help developers create, monetize, localize, and distribute their mobile games globally. CocoaChina also helps fuel the growth of mobile gaming industry by investing into core technologies, such as Cocos2d-x. Headquartered in Beijing, China, CocoaChina also has offices in Sunnyvale, California and Tokyo, Japan. For more information, please visit http://www.chukong-inc.com/.